Among the ground-based remote sensing techniques, the Cosmic-Ray Neutron Sensing (CRNS) has shown good promise to capture soil moisture at relevant scales. Briefly, fast neutrons are produced by nuclear interactions between the incoming cosmic rays and elements of the Earth’s atmosphere (Zreda et al., 2008). When they reach the soil surface, they penetrate to a certain depth and are scattered back into the atmosphere. Since fast neutrons are mainly moderated by hydrogen, the fast neutron intensity at a near-ground-level is negatively correlated with the near-surface soil moisture. 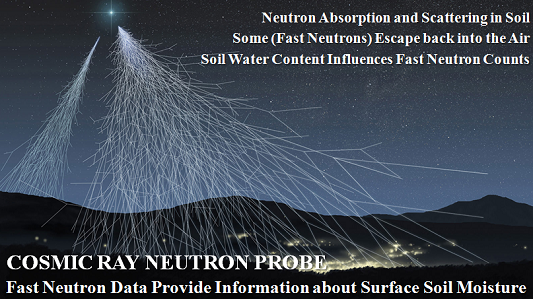 For this reason, soil moisture can be inferred from the fast neutron intensity measured by Cosmic-Ray Neutron Probes (CRNPs) (Zreda et al., 2008). The CRNP measures integral soil moisture in a circular footprint centered on a detector. This radius varies between 130 and 240 m depending on the site conditions, which is significantly larger than the typical spatial correlation length of soil moisture patterns (Western et al., 2004). The penetration depth of CRNP measurements varies between 15 cm for wet soils to 55 cm for dry soils (Schrön et al., 2017). Due to this large sample volume, the information content of CRNP data could potentially improve the estimation of effective SHPs for land-surface models because the scale mismatch between sample volume and model resolution is much smaller. From this webpage you can download special versions of computational modules of HYDRUS-1D (both its direct and inverse modules) that can evaluate data collected using the Cosmic Ray Neutron Probe. The physically-based COsmic-ray Soil Moisture Interaction Code (COSMIC) (Shuttleworth et al., 2013) is used now in HYDRUS to calculate the aboveground neutron intensity for a given soil moisture profile. You can download below a brief report describing implementation and verification of this implementation, as well as several test examples. Some of these examples were developed for the verification of these computational modules. Both computational modules were used by Brunetti et al. (2018). Download a brief report describing implementation and verification. Download the computational module for direct and inverse problems. Synthetic Analysis of the Cosmic Ray Neutron Probe Data - Synthetic Example (Brunetti et al., 2018). SyntheticI Analysis of the Cosmic Ray Neutron Probe Data - Synthetic Example (Brunetti et al., 2018). Inverse mode. Rollesbroich Analysis of the Cosmic Ray Neutron Probe Data - Rollesbroich Example (Brunetti et al., 2018). Brunetti, G., J. Šimůnek, H. Bogena, R. Baatz, J. A. Huisman, H. Dahlke, and H. Vereecken, On the information content of cosmic-ray neutrons in Bayesian optimization of soil hydraulic properties, Vadose Zone Journal, (accepted September 24 2018). Shuttleworth, J., R. Rosolem, M. Zreda, and T. Franz, The COsmic-ray Soil Moisture Interaction Code (COSMIC) for use in data assimilation, Hydrol. Earth Syst. Sci., 17, 3205-3217, doi: 10.5194/hess-17-3205-2013, 2013.